Time to dish up another variation on some recent themes: talent running in families and the Ringling Bros. and Barnum & Bailey circus. Please bear with me, though; I think this episode of Surfing the Surnames promises to be a lot of fun. 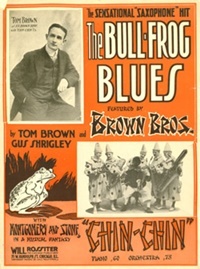 Brown may not be the brightest of colors, but the name has applied to some colorful musical ensembles. 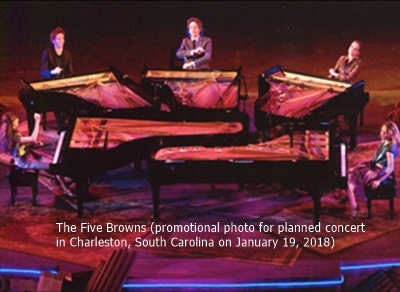 Although they don't seem quite the phenomenon they were maybe a decade ago, "The 5 Browns" will be familiar to most of us who follow the ups and downs of Classical music trends. For those who don't, suffice it to say The 5 Browns are two brothers and three sisters all born in (recently rain-soaked) Houston, Texas, but raised in the arid US state of Utah. Upon concluding simultaneous studies at Juilliard, they followed in the footsteps of The First Piano Quartet (active, under more than one name, 1941-1972 and much recorded during the 78 RPM era) to form an all-piano performing group specializing in arrangements and original compositions for five keyboards. There's even a concerto for five pianos and orchestra written especially for them to play. They have released several top-selling albums and appeared in venues ranging from Carnegie Hall to fashion show runways. At a time when the saxophone was generally heard only in military and large circus bands, second-born Tom Brown (1881-1950), the group's leader and moving force, became interested in the instrument and first picked one up in 1904. In 1908, he and his brothers started as a musical diversion in--drumroll, please, and all eyes on the center ring!--the Ringling Bros. circus, and from that point forward, various combinations of the Brown brothers, sometimes together with non-relatives and probably seldom if ever all together at the same time, often performed dressed as clowns, whether in the circus or on Broadway, in vaudeville, or in minstrel shows. In time, the group contracted with the instrument company Buescher to play its "True Tone" instruments exclusively; curiously, the brothers built their ensemble around tenor, alto, baritone, and bass instruments, with the last-named being the driving force in the joie de vivre of the group's trademarked arrangements, whereas the soprano sax, which would become the staple of jazz bands everywhere, was present only as an occasional "accent" instrument played by Tom. Be that as it may, the Six Brown Brothers became immensely popular. They traveled as far afield as England and Australia, and in the United States they ignited a craze for the saxophone that would persist and solidify as it transitioned from the ragtime that was a Six Brown Brothers staple to '20s jazz and beyond. One of the brothers, Percy, died in 1918, a victim of that year's flu pandemic; the others remained active until the group disbanded in 1933. Only Tom attempted to pursue a musical career thereafter, and with only indifferent success. The craze for saxophones even touched my own family. According to my mother, when she was born in 1921, her father was trying to master the saxophone, but he had to give it up because every time he started practicing baby Mom would break out crying. Everyone's a critic! Whether his instrument was a Buescher I can't say. Now, I've known some records of this pioneering saxophone sextet ever since I first started collecting 78s, all the way back in the middle 1970s. They made a lot for Victor, some for Columbia and Emerson, and, while I've never seen one, some cylinders for a company called Indestructable. In recent years, the Archeophone label has released two major CD reissues containing, together, around 20 numbers recorded all across their career. 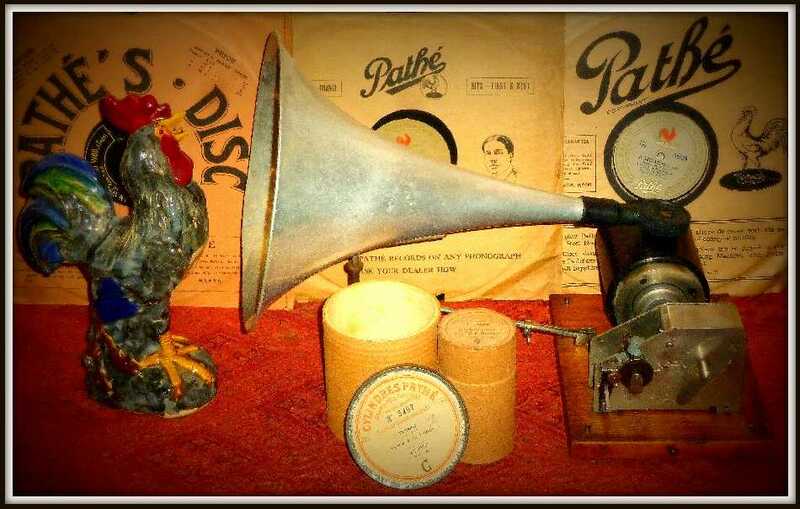 For most listeners, that may be a bit too much of a good thing, but so you can make up your own mind, click below for a recording of the Six Brown Brothers in "Bullfrog Blues," played on a Victor V "talking machine" with oak speartip horn from around 1910. The record is pretty worn and blasts some on peaks, but it should suffice to introduce you to the style of this pioneering group and to give you some idea of what their records sounded like to those who played them when they were still the latest thing. Oh, and, yes, I did insert a fresh steel needle first!